Chicken with Pasta Shells and Caper Broth – This Was GOOD & FAST! (serves 6) | Crappy Kitchen - Good Dinners! This is what I cooked for dinner last night and it was completely addictive. It could have served 6 people but the four of us couldn’t stop eating it until it was gone! We are in the middle of a disgusting heat wave and I really did not want to spend too much time in the kitchen. We still needed to eat so I came up with something that was fresh tasting and very fast. 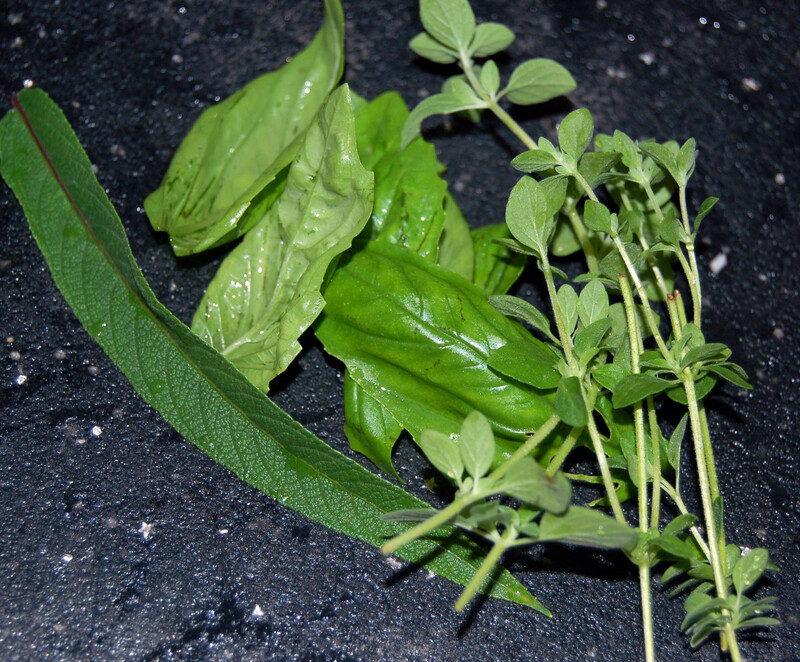 Oregano, sage and basil freshly snagged from my garden! I spotted a jar of capers lurking in the pantry and figured I wouldn’t need to add much more if I wanted big flavors without much effort. I decided not to rinse them to give the broth a nice briny feel and it worked perfectly. That, along with choice herbs from my garden helped make this a very tasty meal which we enjoyed in front of the air conditioner! 1 – Place a tall saute pan or wide metal casserole or dutch oven on medium heat and add the oil. Wait for a minute to let the oil warm before adding the onions and garlic. Cook for 5 minutes, stirring occasionally. Add the herbs. 2 – Turn the heat up to medium/high and add more oil if necessary. Add the chopped chicken and saute for 3 or 4 minutes. Add the capers and stir. 3 – Add the broth (or water and bouillon) and bring to a simmer. Add the kale and stir. It will wilt pretty quickly. 5 – When pasta is drained add it directly to the broth and chicken. Serve in shallow bowls and pass some Parmigiano Reggiano if you like. I added the cheese to my dish and it complimented the capers wonderfully! This entry was posted in "Blood Type A " Recipes, dinners and tagged baby kale, basil leaves, Blood Type A diet, blood type A recipe, caper broth, caper chicken, capers, easy dinner, kale, one pot meal, pasta shells, quick dinner, stove top dinner. Bookmark the permalink.